This No Cross Diamond Knit Cable Pattern is worked over 18 rows and uses both right and left crossings. This pattern, along with the 3 others listed below, is brought to us by Story Publishing to celebrate the new release Cable Left, Cable Right by Judith Durant. This 18-row diamond uses 2/1RP and 2/1LP crossings. 2/1RP – Slip 1 stitch to cable needle and hold in back, knit 2 from left needle, purl 1 from cable needle. 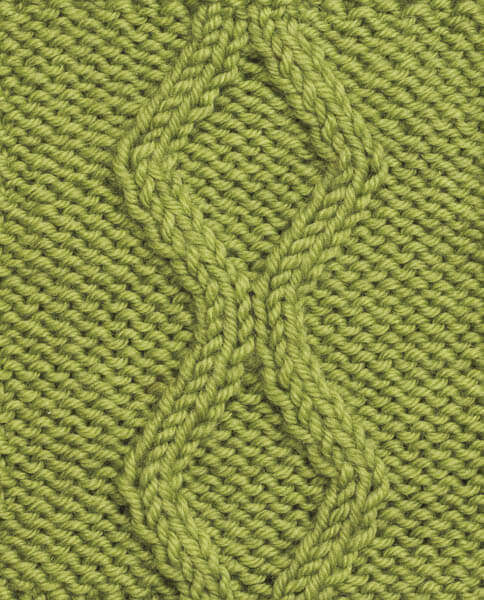 2/1LP – Slip 2 stitch to cable needle and hold in front, purl 1 from left needle, knit 2 from cable needle. I’m a bit confused. This was linked to your post entitled: “Hookin’ on Hump Day” – yet it’s all about KNITTING! No hooking involved here, right? Hello 🙂 Where is the link that you are referring to so that I can check and fix it?